We strive to provide current, accurate information. Please inform us of any inaccuracies. The story goes that having an exceptional musical ability and love for his community, Henderson S. Van Surdam began the band in 1873. He served as the band director for 63 years and retired as the leader in 1938. During this time the band was known as the Van Surdam Hoosick Falls Community Band. According to writings by Cortland Cottrell that were handed down to his son Bill, Cortland started playing under the direction of Mr. Van Surdam in 1935. Cortland stated: "It has always been a policy of this band to provide music of good quality for the people of our community... the love of playing far exceeded the money received." He further recorded that the band used to rehearse every Monday night (during the summer) and played the concert on Wednesday. Rehearsals were held on the top floor of the Armory until 1941 or 1942. Rehearsals were then moved to the municipal building and later to the old high school. In the early 1950's, some of the talented students of Brad Cole, Hoosick Falls High band director, joined the band, and for the first time there were some female players. Band directors recalled are: Henderson Van Surdam, Luke Nichols, Mr. Flagg, John Colton, Lynn McEachron, Bradford Cole, Edward Harmon, Luther Everly, Gunnar Schonbeck, Ralph Bacon, and current director Bill Gaillard. Bill was hesitant to take over the band, but word has it that Fred Quackenbush told him to just stand up there and wave the baton and the band would play. Bill's energy and enthusiasm led to the building of the gazebo which is where the Band performs. Bill has also brought many young people into the band as he was the Senior Band Director for Hoosick Falls Central School for many years. Over the years, the band has become a family affair, with two or three generations having played in the band. To mention a few: Cort Cottrell, his sons and grandson, Bill Gaillard, Carol and their children, Don Pierce and son, the Hoag family, Al Pepe and his children. In the words of Walt Dunham who has played with the band for over fifty years, "Like the famous drum beating bunny in the battery ad, the Hoosick Falls Community band just keeps going and going. A hundred years ago every small town had its own band, playing weekly summer concerts in the park giving pleasure to a population without radio, TV or many other forms of entertainment that we now take for granted. Now the town band has become an anachronism, rarely to be found. In Hoosick Falls, however, the band is an institution that has been part of the Town’s history and shows no sign of falling by the wayside." Please come and experience for yourself the summer concerts performed by the well-loved Hoosick Falls Community Band. 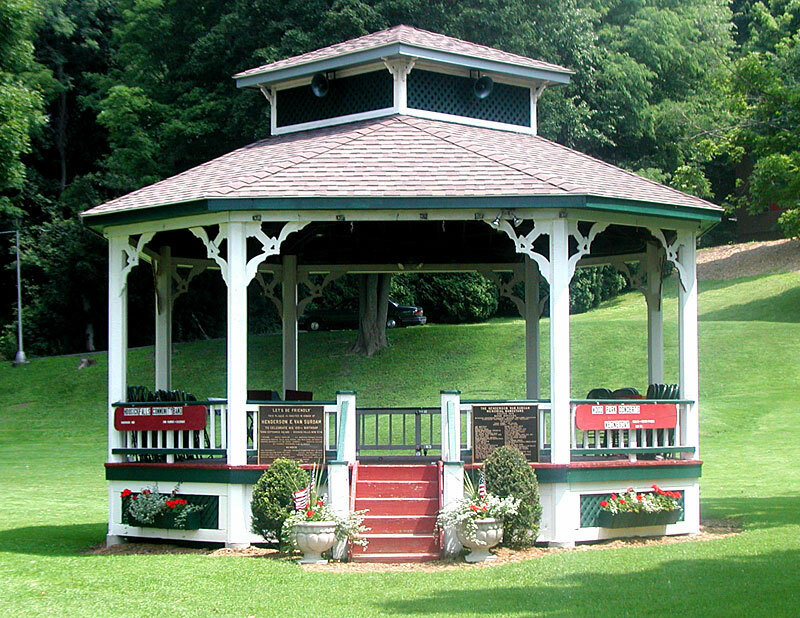 The free concerts are played in the quaint gazebo in the Village Park on Main Street every Wednesday evening during the summer.